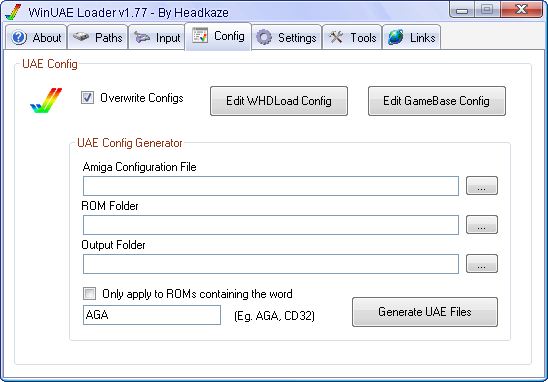 WinUAE Loader is a WinUAE launcher for arcade cabinets. 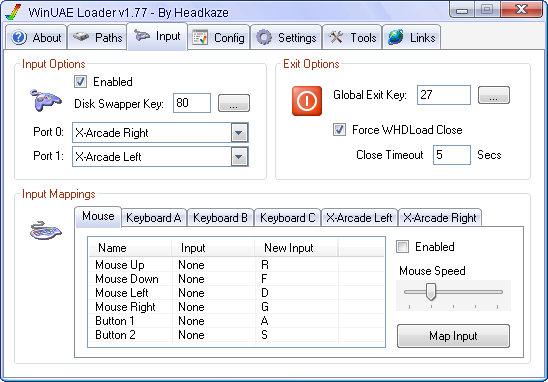 It supports GameBase Amiga, SPS and WHDLoad game sets and allows you to remap input to suit arcade controls. 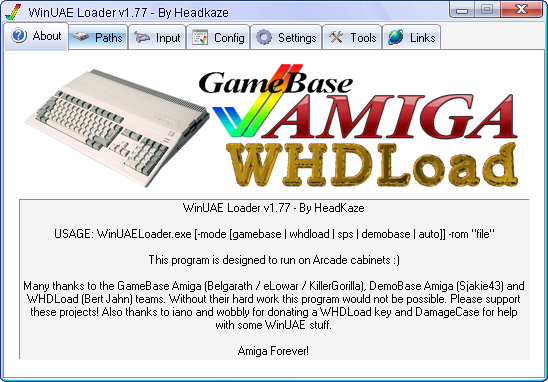 WinUAELoader.exe [-mode [gamebase | whdload | sps | demobase | auto]] -rom "file"
WinUAELoader.exe -mode whdload -rom "NinjaRemix_v1.3.zip"
01-07-2008 v1.6 - Updated GameBase Amiga database to 2.6. 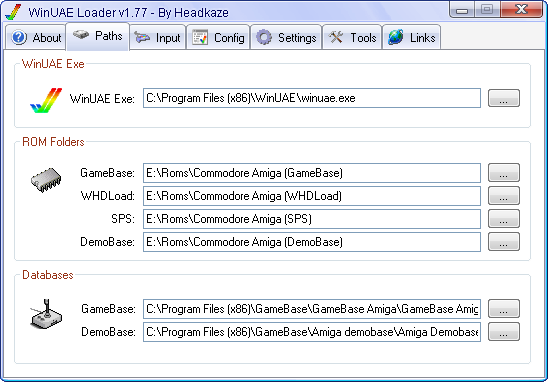 Added support for GameEx's new database format. 16-06-2008 v1.52 - Separated screen, depth and refresh rates. Added 50Hz (PAL) support. 03-02-2008 v1.36 - Added filtering for GameEx map generation. 31-01-2008 v1.2 - Removed "Force Use Mouse". Now you can set any control for port0/port1. If you want the mouse permanently in port0 just set it to Mouse. 31-01-2008 v1.1 - Mouse is now disabled for simultaneous games. Added delete temp files for WHDLoad. Two player game ports are now swapped over. New "Force Use Mouse" option to turn on mouse for all games. 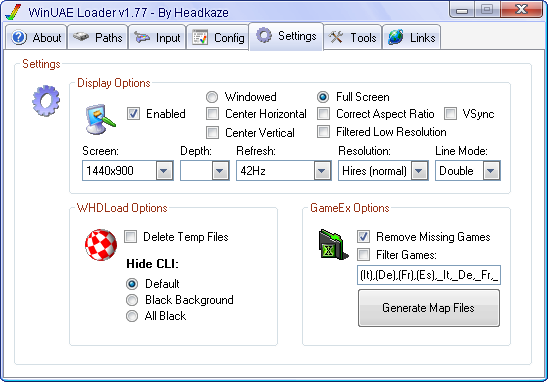 30-01-2008 v0.91 BETA - Added "Generate Map Files" with ability to remove missing games for GameEx. Key mapping is not turned off when WinUAE is not running. Import them using the Setup Wizard or Advanced Configuration application. Make sure you set your paths correctly. 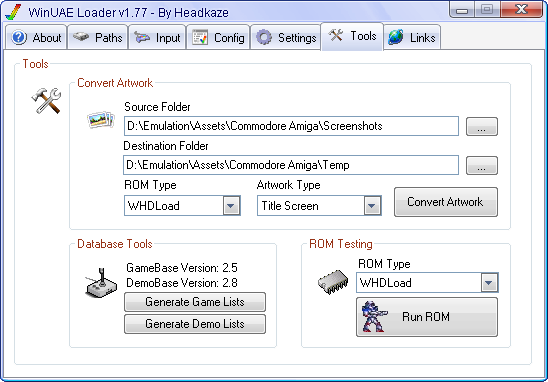 You can use the "Run Game" under Game Testing in Tools to test games before you run them in GameEx. I suggest you do that before attempting to run them in GameEx. You can use the "Input Mappings" to map keys to anything you want. Default settings are for X-Arcade -> IPAC. Note: You need to tick the "Enabled" checkbox to actually turn mappings on for that input profile.